Last Tuesday, friends gathered for a sewing day to begin the process of assembling the blocks received for the California Fire Quilt project. I asked everyone to just bring a dish for our potluck lunch, and no sewing stuff, as using all my machines helps to keep them in working order. Picture heavy post coming! Two sewing areas were set up with two machines on each one so we could work on two flimsys at once. I turned my Brother machine around to the other side of the table so someone could use the Kenmore at the same time. 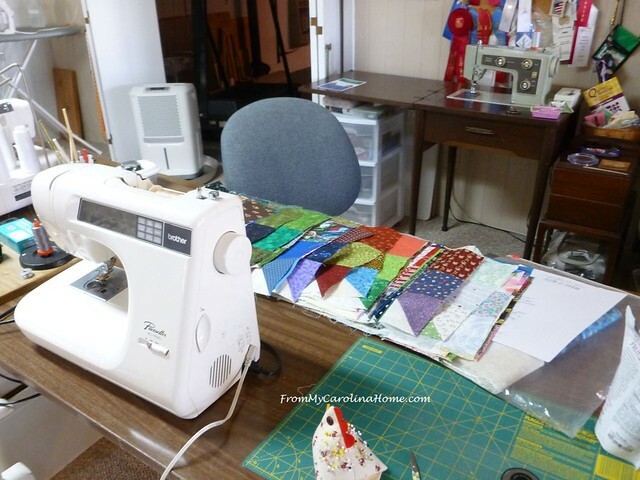 This station was set up for two sewing and one to press and help with pinning. I had pulled a set of 56 blocks for this group to assemble into a flimsy. The instructions for this setting were written out, and I went over the plan with this team before we started. This group of three worked on the mountain peaks setting. I’m just calling it that, I am not sure if it has a name. The darks and lights are arranged with the darks pointing up and the lights pointing down, and the peaks offset by one block. The ends all have a half peak of one block, alternating the ends. We piddled with the placement, moving things around for several minutes, then just before picking them up I remembered to grab the camera to get a ‘before’ pic. Each row was then labeled with its row number and which way to press the seams to keep that straight. With three working on the quilt top, the work went nicely. It was so helpful to have one to assist with pinning, then do all the pressing. At the end of the sewing time, there were only a couple of seams left to join the big pieces, so I did that before stopping for the day. Thank you to Bonnie, Carol and Marti for all your hard work on this one!! 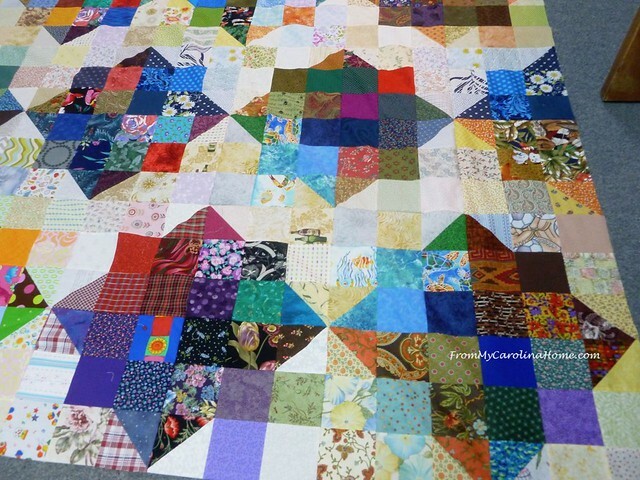 Is your block in this quilt? One more close view of the other corner. On the table, two more machines were busy that same day as Bridget and Sam worked on a second quilt flimsy design. Again, I had pulled 56 blocks and wrote out the instructions for this design. I planned to help this team as the third member. Laying it out on the floor in the back area where I keep my plants and stamps, we could rearrange the blocks into the square in a square design. Everyone came in to see, and we spent quite a bit moving colors around. You can see the bright pink sticky notes we used to mark the rows A-D, since these rows were two blocks deep per row assembling the large squares first. Here we wound up with the same fabric in two blocks side by side on the bottom row (the green print and the white tones), funny after mixing up the blocks that we managed to put those two together again. A quick flip with another block solved that. And still we messed around with it, redistributing the yellows, paying attention to the reds. 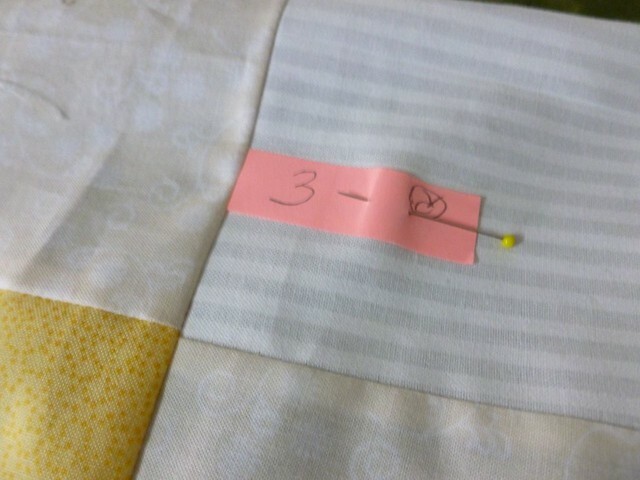 Finally, it was declared good, and sewing began in earnest. I worked on ripping out the last of the stitches on the first quilt that I showed you on Friday, then went to get our lunch in the oven. I totally forgot to take any pictures of the wonderful food!! We ate really well!! Chicken pasta mushroom casserole, califlower salad, baked zucchini, homemade bread, green beans with an herb accent, and hummingbird cupcakes. Yummy!! 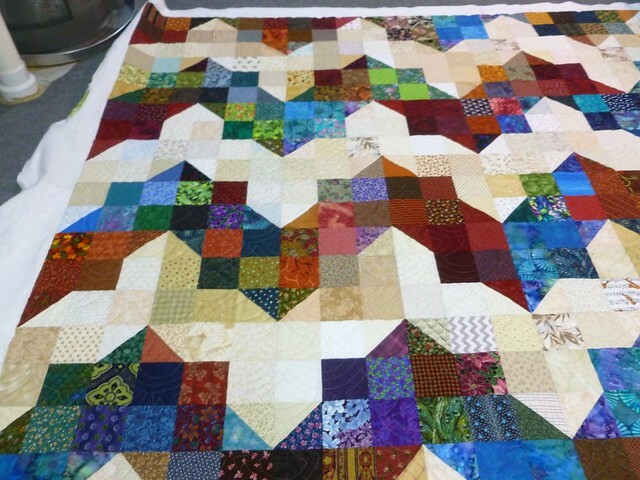 At the end of the day, the second quilt was almost done, just a few seams left to do. 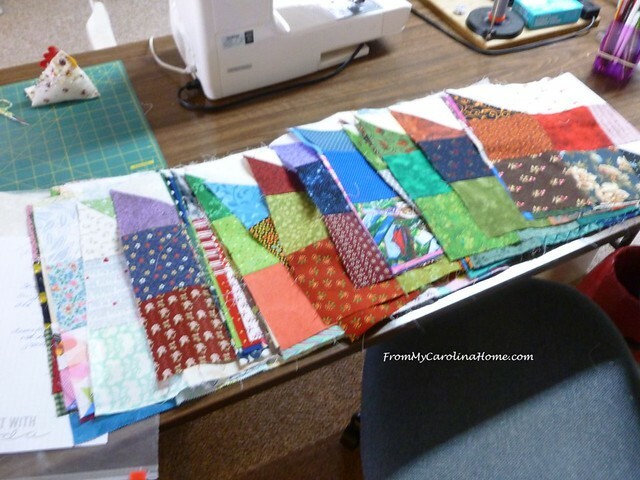 I wasn’t able to help pin as much since I had to work on the ripping out the stitches on other quilt. So, on Friday, I went ahead and got the rows assembled into the flimsy. Maybe you see one of your blocks on this one. 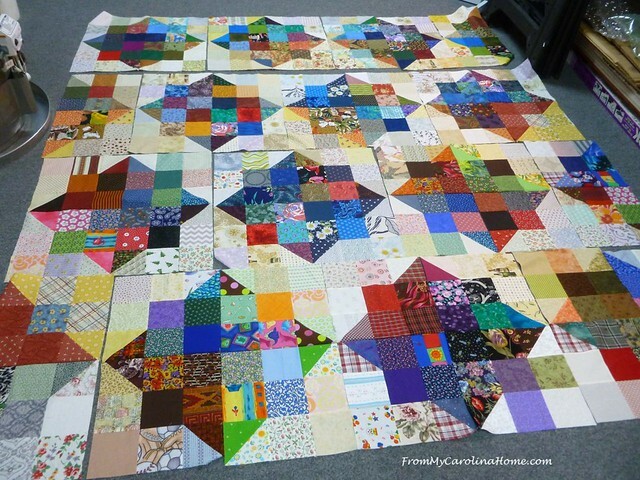 We put the half-squares on the ends to make the quilts 7×8 blocks, alternating sides. The wide array of colors and prints makes this one a fun design, almost could be an I Spy too. Can you find the little dog? One more bit of news on this project. My neighbor’s son who will receive one of these quilts was in town this week for a sad reason. His father passed away, so he came for a few days to help his mother with the arrangements. They planned to move in March, and she still plans to do that so he will be back to assist her move and sale of her house. While he was here, I asked him and his mom to come up to the house for a visit without telling them why, only that I wanted to show them something. When he got here, I showed him the three quilts in progress, told him about the Fire Quilts project, and asked him to choose the one he wanted. He was really touched by the outpouring of support, and chose the zigzag one below. 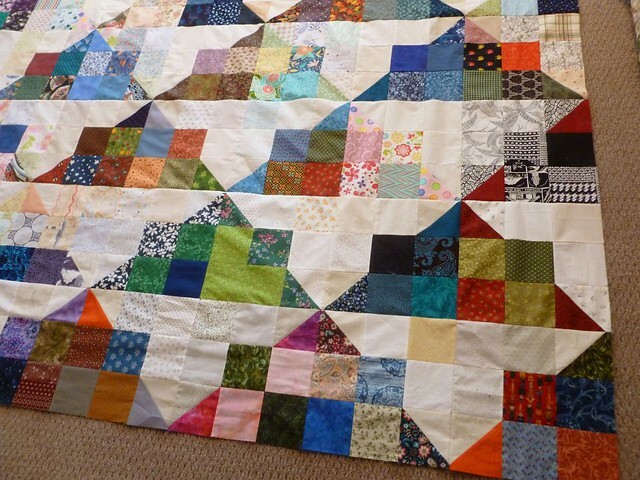 He and his wife want to send their sincere thanks to everyone that participated in the project, and to tell you that the quilts are beautiful. I went ahead and made the binding, and got it sewed on the this quilt. The handwork will take a while, but I need something to do while the last of the football games are on, and I really do enjoy the whip stitching. I’ll have the binding done by the time they get back and will deliver it to them then. 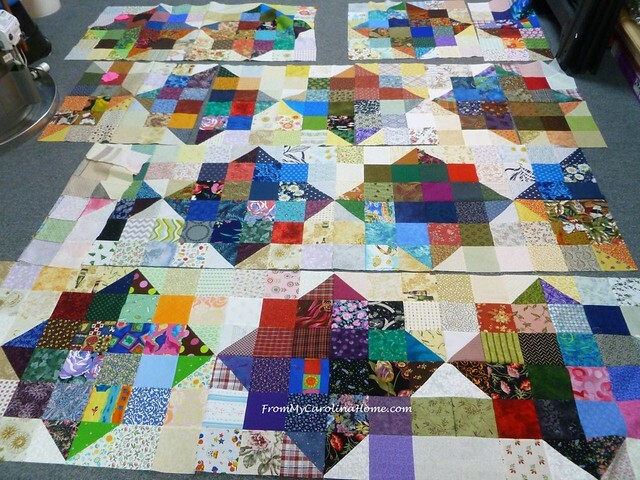 In the meantime, there are two more quilt flimsys to quilt, binding to make and so many blocks that I’d like to assemble them into flimsys to ship, rather than just shipping blocks. 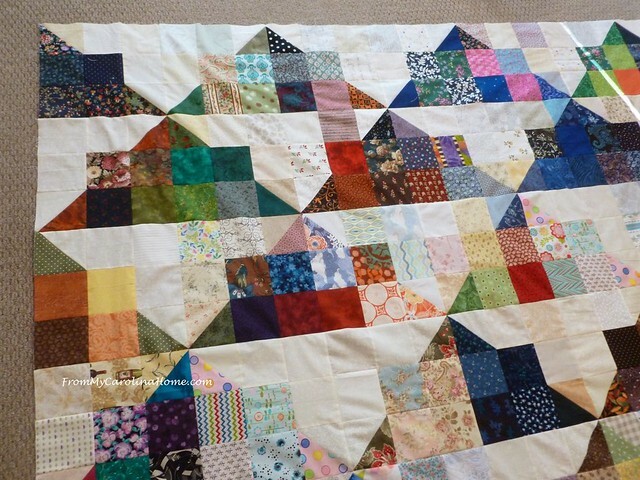 I’ll be able to include the lovely blocks from Jo B, who shipped hers all the way from Australia, thanks Jo! I hope I can get a bit of help with the second crew of friends soon. I think sending two shipments is going to be best, and I’ll try to get at least one out by the end of next week. If it snows again, like the weather guy says it might, I’ll have quite a bit of time to work on that. But I have several other projects to do as well, so I just need to get busy! February is coming too soon!! Thank you to everyone that participated in this project. We did good, didn’t we? Did you see one of your blocks? I enjoyed hearing about the work day on the Fire Quilt project. 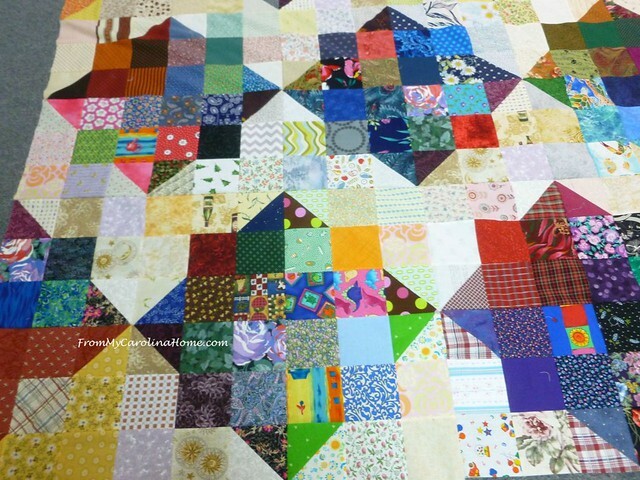 All three quilts are lovely in design and color. Your beautiful pics gives a good idea of how this block can be used. 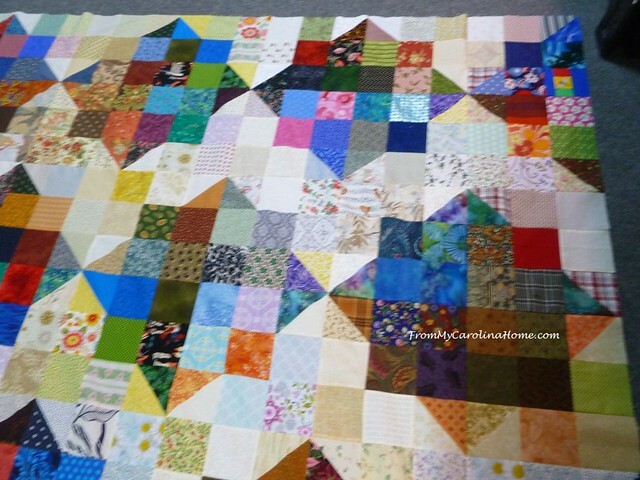 You and your quilting friends are most generous of your time and talent. Thanks you for sharing. What a great effort by your group! It is really fun to see these all coming together. Thank you! I think you and your crew deserve a huge pat on the back, and probably a massage, too! Well done!!! 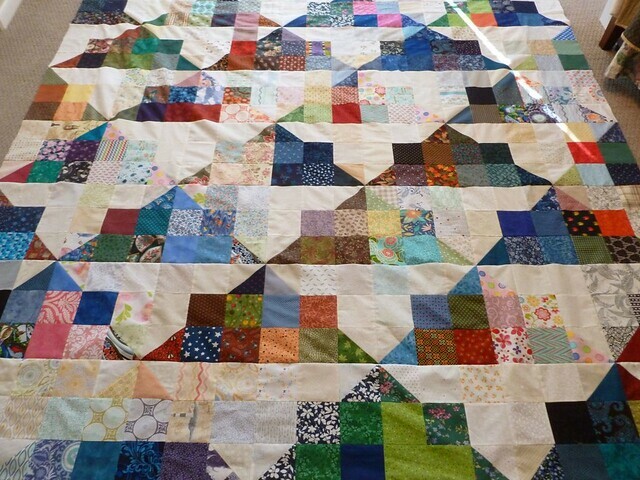 I really like the layouts for these quilts. You and your friends are very generous with your time and talent. Great job! That was a lot of set-up work. Love what you all did. Bless you! You are SO organized !! I know that the friends who came to help were happy you had thought through so many details! Isn’t fun to have another few sets of eyes when it comes to placing all those block? I SPY several of my blocks. That puppy was one of mine. Funny story about it. I use a lot of panels making story books for grandchildren, and that puppy was just “extra print” on the “unused area” of the panel, not intended for the book. I thought he was just too darn cute to discard, so I used every inch of that panel (minus book instructions) when I cut up the scraps! I had thought it might make a cute apron pocket or something, but it so happened it made it’s way into these blocks. 🙂 THANK YOU for your wonderful work getting these quilts together. Your gift to the neighbor’s son is going to be well appreciated. What a hard time for that family right now. Hopefully they will feel the love. I am sure the recipients of these quilts will be most apppreciative of your quilting team’s effforts. What a lot you all accomplished in a day’s work. The mountain tops lay out is my favorite, but the others are equally beautiful! 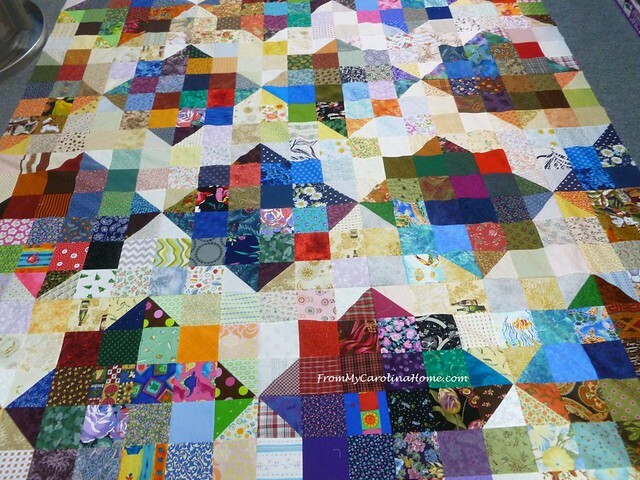 It’s so incredible the beautiful quilts all these blocks from all over the place have come together to create! GOOD WORK!!!!!! 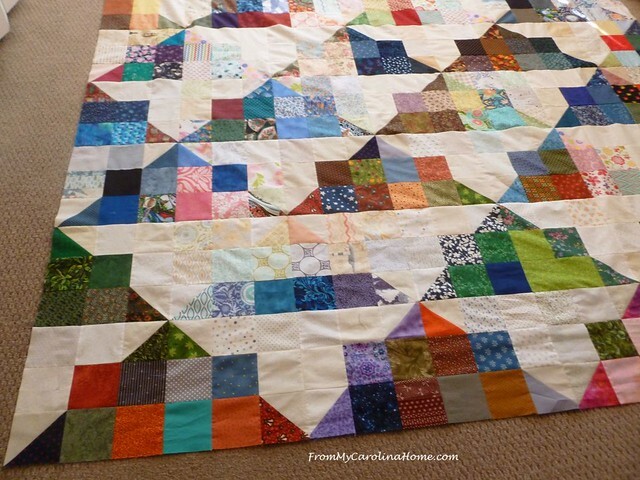 Loved your post, so interesting to see how you made the quilts, step by step. I hadn’t come across this block before I made them for your Block Drive. 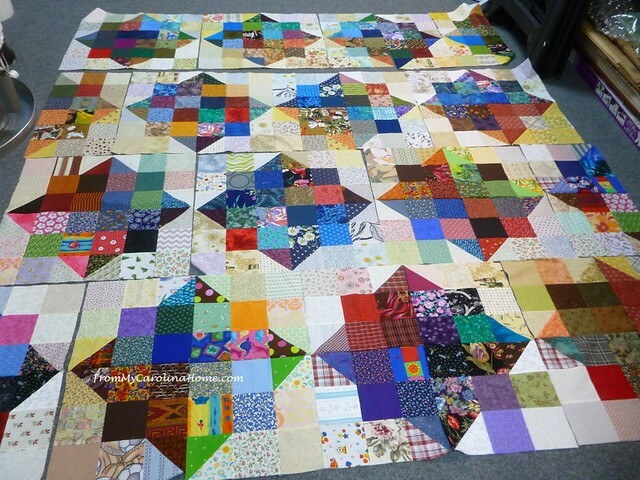 It is so interesting to see how you arranged the blocks to make such great quilts. I was so thrilled to find my blocks in the Square in a Square setting. Glad Jo’s blocks arrived safely from Australia. Carry on the good work with your supportive sewing pals. Thank you for letting us be a part of your work day. Fantastic project. What an awesome group of friends you have. These quilts are all stunning. 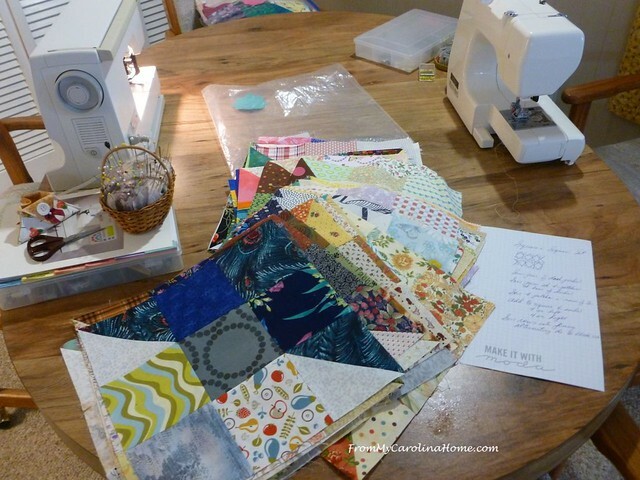 I love seeing how the Thomas Fire Quilt Block can be laid out in different ways, each creating a beautiful quilt and the scrappy fabrics and colors just work so well. What a great job you did planning to optimize productivity for your sew days too! Great job. My heart goes out to your neighbor whose son lost his home to the fire and now his father has passed. I’m sure the fire quilt you made for him will give him a much needed quilty hug. Bless you. You are doing great work, keep it up! You and your friends have outdone yourselves again. Amazing all the different designs that are possible from a single block. 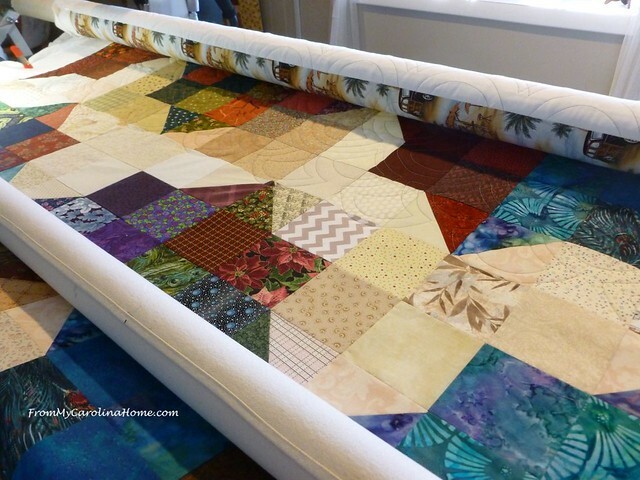 Did you come up with the layouts or were they suggested by the Ventura Modern Quilt Guild? We’re still in out topsy-tervy weather. Forties today then back to 20’s, then I think one more round of 40’s before we hit the deep freeze again. February is supposed to be very cold and snowy, but we leave for FL on the 5th, so we will escape the worst (as long as it doesn’t follow us south!). Wow! Well done teams, such great work with beautiful results. This was certainly a heart warming effort. PS, spotted some of my blocks in the first top…lol. Great layouts! So wonderful that you know someone who will receive one of the quilts! Such a versatile block, who knew? I love all of them. Kudos to your sewing friends and all their hard work. Hope some more step up to the plate. 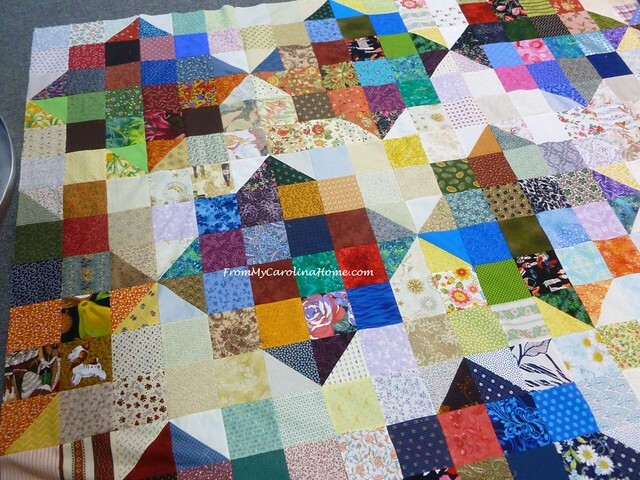 Great photos, great story, in the true spirit of what it means to be a quilter! Thanks! 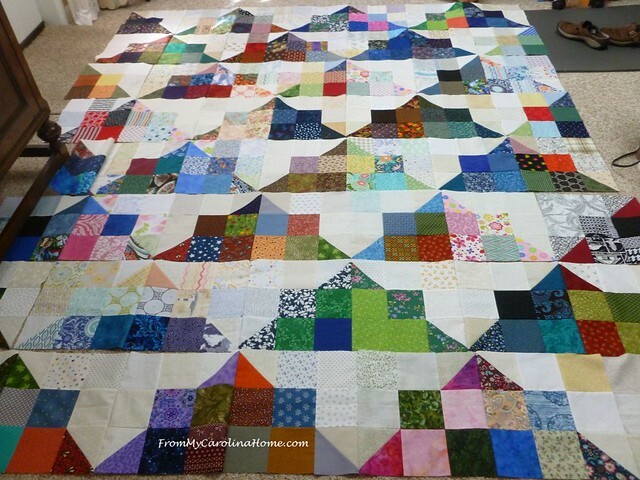 These blocks are so interesting and such fun to see sewn together. Great job. Great teamwork on a wonderful project! Thanks for sharing the story of your neighbor’s son. I was touched by that. Well done to everyone! What a great days work The quilt tops look wonderful and how nice to be able to let someone choose their quilt. Love how you have created different patterns from the blocks. those quilts are awesome. kudos to you and the team who put them together. your neighbors sons family sure has been through a lot. I would not have been able to chose one quilt. they are all beautiful. thanks for doing what you did and allowing others to make blocks and send them along. It’s so sad to hear about your neighbours son & family. Losing his father is terrible. Hope this quilt gives him some comfort. Keep up the good work. Can’t believe the variety you all achieved from basically the same blocks… gorgeous. You called it square in a square, it looked like lovely medallions to me! SO proud of all of you! esp Carole, you shoulder a lot, dear lady. 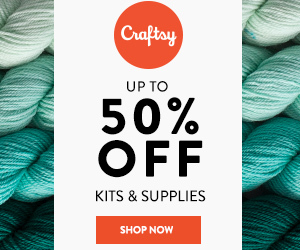 general question: years ago I sold some Cross Stitch magazines on a site where one could buy or sell back issues of good craft magazines. We then put them in good envelopes and sent them off. 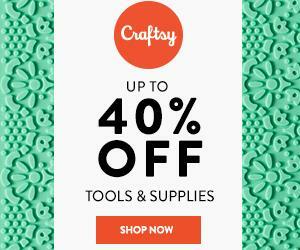 Is there such a place anyone knows to sell old quilting and other crafting magazines? sometimes it’s for just enough to cover postage, but then I’m not tossing good stuff! I’ve tried to take them to assisted living and was turned away. Sad! when I worked home health, there was always a magazine exchange in-house, and I brought and took! I found one of my blocks! I love seeing all the different layouts, thanks for posting so many pictures!! I’m glad your friend was able to pick out the quilt he liked best but sorry for the circumstances that brought him to the area. Great work by you and your sewing crew! This is such a wonderful effort from all involved. You must be delighted with the results!! 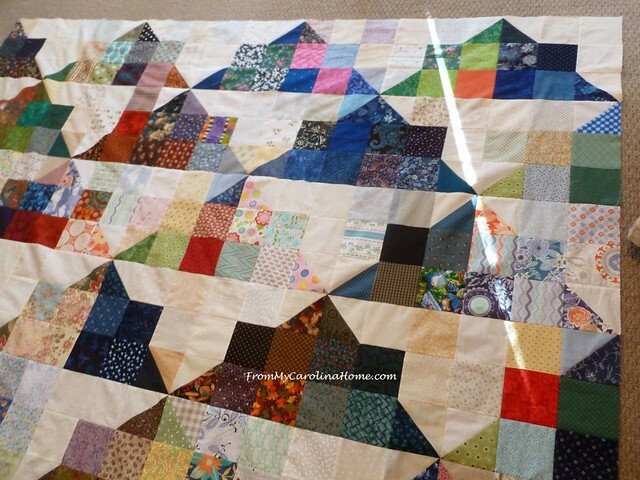 Please tell me where l may find the pattern for these quilts. Thank you. New steps are published the third Friday of each month and the mystery will run to June.